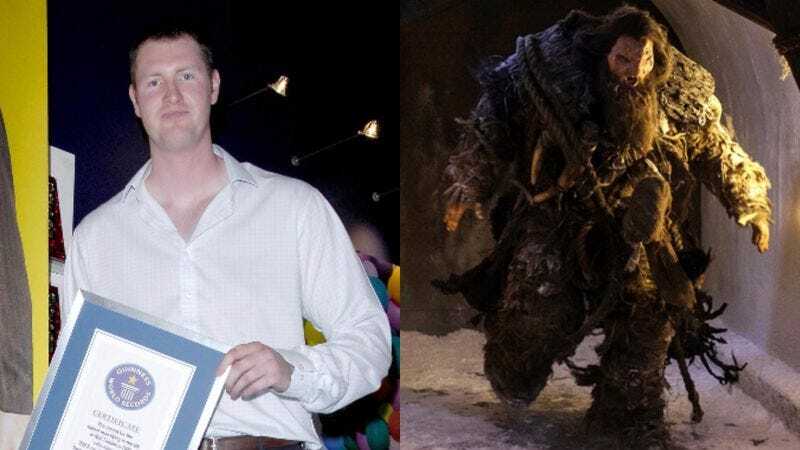 Neil Fingleton, the U.K.’s tallest man and an actor who appeared in Game Of Thrones and Doctor Who, has died. That comes from The Guardian, which lists his cause of death as heart failure. Fingleton was 36. Fingleton was born in England in 1980, but moved to the United States as a teenager after attending a basketball camp and realizing he wanted to pursue the sport more seriously. At more than seven feet tall, Fingleton quickly took to basketball and stuck with it through college, eventually reaching the semi-professional American Basketball Association and then the NBA Development League. His basketball career ended due to an injury in 2007, though, so he decided to return to England and pursue an acting career. His most prominent role, however, was probably as Mag Mar Tun Doh Weg—a.k.a. Mag The Mighty—on Game Of Thrones. Mag was the leader of the giants and part of the “Free Folk” army that attempted to attack the Night’s Watch in the season four episode “The Watchers On The Wall.” He gets killed trying to force his way through a tunnel under the Wall, taking a number of Night’s Watch guards with him.